« Are You a Super Busy Super Woman? Here’s 6 Frugal Tips That Can Help Save You Money! Finding healthy snacks that the whole family will love is not always easy. These days, you have to constantly be on the lookout for foods packed with trans-fat, artificial sweeteners, flavors and colors. Portability is another factor, for I like to have snack options that can easily be taken for lunch or thrown in my purse for a quick bite to eat on the go. One snack-friendly food that every member of my family loves is popcorn! That's why I'm so happy to have discovered Oogie's Gourmet Popcorn and had the chance to review a slew of their yummy flavors. Keep reading to learn more! 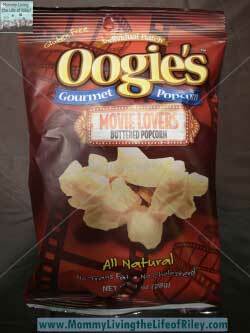 Oogie's Gourmet Popcorn is unlike any variety of popcorn I've eaten before because it is actually healthy! They use only the finest all-natural ingredients, which means no artificial flavors or colors, ever. 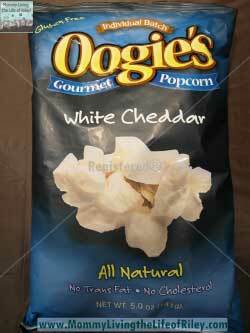 Their exclusive non-GMO corn is the foundation for a perfect kernel and can only be found in a bag of Oogie's. They also kettle pop in 100% corn oil for a delicious treat that has no cholesterol, no trans-fat and is entirely gluten-free. Oogie's Gourmet Popcorn flavors feature a unique cast of characters including bold aged cheeses, fresh aromatic herbs and zippy spice combinations that deliver a show stopping treat. Whether you prefer an outspoken Spicy Chipotle & Lime, a light-hearted Sun-Dried Tomato and Parmesan, a classic Movie Lovers Butter or an audacious Cracked Pepper & Asiago, their original flavors never lack in personality. My family was ecstatic when the box of Oogie's arrived at our doorstep for we are all tried and true popcorn lovers who are doing our best to eat healthier foods. The great news was that Oogie's Gourmet Popcorn fit the bill! It tasted great, was super fresh right out of the bag and came in such a wide range of flavors for an endless amount of variety. My husband has a more exotic palette than I do and he loved the Spicy Chipotle & Lime and Sun-Dried Tomato & Parmesan flavors. I on the other hand, tend to stick more to the classics and couldn't get enough of the White Cheddar and Movie Lovers Butter. With such an extensive range of flavors, I'm sure your family will have a hard time deciding which one to try first! 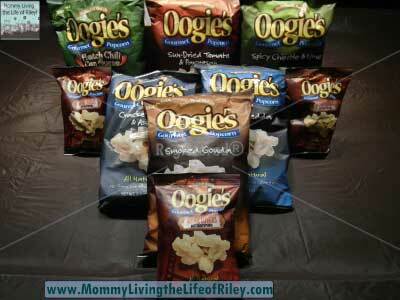 I'm a huge fan of Kettle Corn and can't wait to try Oogie's newest flavor! This variety was just released in September and would be perfect for the holidays, since there's nothing better than Kettle Corn around Christmas! If you would like to introduce your family to a healthy snack that everyone can agree on, then I highly recommend giving one of the delicious popcorn flavors from Oogie's Gourmet Popcorn a try! Disclosure: I received the sample of Oogie's Gourmet Popcorn shown above from Oogie's Gourmet Popcorn in order to facilitate my review. No other compensation was received. This product review is based on my own personal experiences with this item and is completely honest and objective.